Carnival Legend chefs can cater for cruisers with special dietary needs; it's always best to let the cruise line know before your sailing what your specific needs are. But generally speaking, there are always at least two vegetarian dishes offered at every meal, gluten-free bread is available all the time and at least one dessert is "no sugar added." For gluten-free meals, you'll need to work with the maitre d' in your dining room each night to pick out which menu item you want for the next night's dinner. Gluten-free pizza is also available 24/7 at Pizza Pirate in the buffet. Truffles (Decks 2 & 3): The full-service restaurant, Truffles, is a two-level 1,250-seat dining room with extensive three-course menus and wine lists. Truffles is open most days for breakfast, lunch and dinner -- though on select sea days, breakfast may be replaced by a Sea Day Brunch. Breakfast features all the usually morning options from cereals and pastries to varied egg dishes and pancakes and French toast. Lunch is a bit heartier with sandwiches, hot dishes and desserts. The Sea Day Brunch is a mix of the two. Also on select sea days is the "Long Lunch at Sea," which is a three-course lunch costing an extra $30 a head. It features dishes like grilled cold-water lobster tail and blue-crab salad, while a fresh seafood platter can be enjoyed for another $20 per person. A selection of wines to pair with the dishes will cost an extra $20 per person. For dinner passengers can dine at set meal times (the "traditional" early seating or a late seating) on Deck 2 or opt for open dining and then eat anytime between 5:30 p.m. and 9:30 p.m. on Deck 3. Dinner menus are divided into several sections: appetizers (called entrees in Australia), rare finds, mains, every day favorites, side dishes and international flavors. Appetizers always feature a Caesar salad, vegetable spring rolls, a hot and cold soup selection, and also might feature diced melon, Thai beef salad, jumbo prawns and spinach and ricotta crepes, among other options. Rare finds are appetizers that Carnival believes might be a new experience for cruisers with meats on offer that include rabbit, venison, wild boar and escargot. Mains might include such items as teriyaki salmon, veal Marsala, corned beef and cabbage, chicken pot pie, grilled fish and filet mignon. There is always an Indian vegetarian dish, as well as one other vegetarian dish. The everyday favorites are available on a daily basis. In Australia, the choices are salmon filet, chicken schnitzel, meat pie and grilled sirloin steak (more of a skirt steak than anything else). Sides typically include steamed broccoli or green beans, baked potato, French fries or mashed potatoes (in Australia, chips or mash), caramelized carrots and fried noodles. International flavors are typically inspired by the destinations you're sailing in; they comprise one appetizer and one main choice. Also on the menu are "Steakhouse Selections," through which diners can sample dishes normally served in the fine-dining steakhouse restaurant, Nouveau. The choices, such as lobster and filet mignon, cost an extra $25 each. The dessert menu always features Carnival's signature chocolate melting cake, as well as a rotating selection of ice creams, sorbets, cakes, pies and pastries. Unicorn Cafe (Deck 9): The ship's buffet restaurant, Unicorn Cafe, is open for breakfast, lunch and dinner and also serves free 24-hour pizza and ice cream. Meal choices at breakfast include bacon, pancakes and a variety of eggs. Lunch and dinner choices include salad fixings, a soup of the day, pies and sausages, cold meats, hot dishes like beef stroganoff and chicken satay, Asian noodle or fried rice dishes, and deli sandwiches. Free lemonade, sugarless iced tea and water are available at beverage stations throughout the buffet. Starters (entrees in Australia) include escargot, beef carpaccio, ahi tuna tartare, jumbo prawns, Australian blue crab cake, baked onion soup and four salad choices. But, it's the main courses that are the restaurant's prime draw with filet mignon, grilled lamb chops, prime strip of loin steak, broiled lobster tail, Maine lobster ravioli, surf and turf, rosemary-infused chicken and the fish fillet of the day (usually a Chilean sea bass) on offer, among several other steak options. Side dishes available include baked potato, sauteed medley of mushrooms, potato mash with wasabi horseradish, creamed spinach with garlic and steamed broccoli. Desserts include a cheesecake, caramelized apples baked in a puff pastry and the indulgent chocolate sampler with four small servings of bittersweet chocolate cake, banana panna cotta, tiramisu and chocolate marquise. Also available are fresh fruits, a cheese plate and select ice cream and sorbet flavors. Bonsai Sushi (Deck 2); a la carte: At Bonsai Sushi, passengers can sit at the bar or at tables for two and four and choose from a menu featuring sushi rolls, sashimi, bento boxes (or larger sushi/sashimi meals for two, called shiploads), along with miso soup, Japanese desserts and sake. Items are priced from as little as $2 apiece, with most in the $5 to $8 range. Bonsai Sushi is open for lunch (on sea days) and dinner. Seafood Corner (Deck 9); a la carte: Located outside of the Unicorn Cafe, just steps away from the main pool is this seafood counter loaded with lobster rolls, oysters, crab cakes, chowders and platters plus lobster, crab and prawns by the pound or half-kilo ($22 for a half-kilo of snow crab, as an example). In Australia, prices start at $2.50 for a single oyster or $5 for New England clam chowder in a bread bowl. The fried seafood platter featuring fish, prawn, clams, calamari and fries is $13. Open from noon until late. The Chef's Table; $75: Also available on all of Carnival's ships is The Chef's Table dining experience, which affords a dozen passengers an eight-course dinner with a master chef, a private cocktail reception and a tour of the galley and its operations. 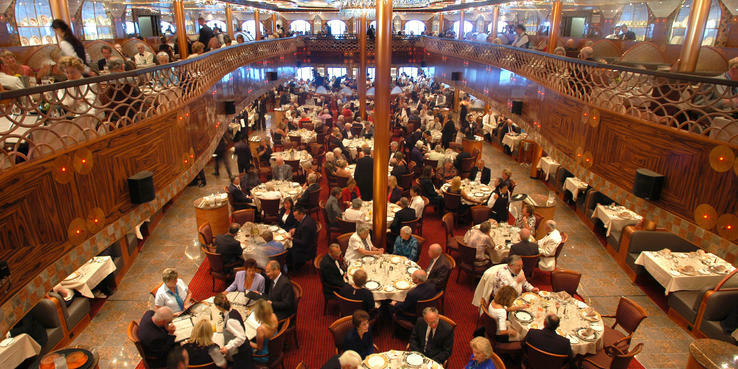 This dining option usually takes place in a non-traditional venue, such as the galley or library, and it can be booked onboard at the information desk. It happens twice on most cruises, or according to passenger demand. Legends Cafe (Deck 2); a la carte: Just near the pub is Legends Cafe, offering espresso coffees (flat whites, long blacks, short blacks and cappuccinos that Aussies love), cakes and pastries at extra cost. Australians, who are coffee fanatics, will be pleased to hear that baristas hail from the Australian Coffee Academy. Room Service: On Australian sailings, the free room service items are removed from the menu and selections are priced individually from about $3 for breakfast items (such as fruit and cereal), $4 for breakfast breads and pastries, $4 for soups and salads, and about $7 for pizza, sandwiches, pies and chicken wraps. Desserts are $4. It's a limited menu.